The Australian-based Short+Sweet Theater will be showcasing 10-minuter plays in Manila this February for the first time. 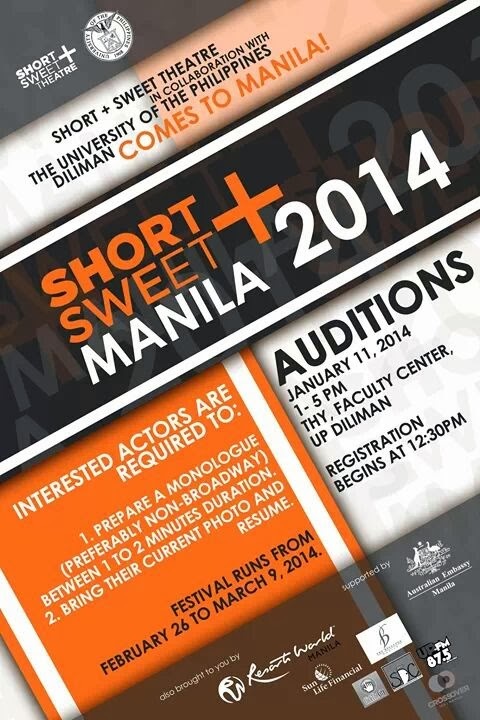 Auditions will be held on January 11, 2014 at Tanghalang Hermogenes Ylagan, Faculty Center UP Diliman, Quezon City, 1-5 pm. Experience the Short + Sweet-est 10 minutes of theatre performance! Short+Sweet is an Australian theatrical initiative that has grown into an international creative brand - presenting Theatre, Dance and Music Festivals, all made up of works that last just 10 minutes or less! The Sydney program of S+S is now the biggest short play festival in the world. Other cities to host annual festivals include: Mumbai, Melbourne, Singapore, Canberra, Kuala Lumpur, Newcastle, Chennai, New Delhi, Dubai, Bengalaru, Penang, Brisbane, and now, Manila. Festival participants are made up from established, emerging and aspiring actors, writers, directors, singers, choreographers, composers and musicians. S+S is a powerful developmental program that provides them with a professional platform to showcase their talent and foster professional career opportunities in the stage, film, TV and radio. Short+Sweet Dubai 2013 Winner: "Perfect Stillness"
Short + Sweet, in collaboration with the University of Philippines, will be hosting the Short+Sweet Theatre Festival in Manila from 26 Feb 2014 to 9 March 2014.